The contractors at Crawl Space Solutions of Arkansas specialize in basement finishing -- it's what we do every day! We can finish your basement in less than two weeks! Arkansas basement remodeling is growing very quickly in popularity, particularly in the North Little Rock area. As it does, companies are scrambling to design basement finishing systems that they can then sell to this new marketplace. Drywall products are being made that are slightly more resistant to mold. Additionally, new wall products that use fiberglass, fabric, and even string are being offered all over Arkansas. Are these basement finishing products advantages or simply alternatives? Is there really anything out there that will prove superior to simply hiring the guy down the road to come in and hang drywall in the basement? Crawl Space Solutions of Arkansas would like to show you the steps of their services so you can see how they really stand out from the crowd. From the first call on, these are the basement remodelers with the services, products, and results you need. Crawl Space Solutions of Arkansas is committed to providing the best service from the first contact onward. When you call or e-mail us for your free basement remodeling estimate in Arkansas, count on a trained and professional representative to answer right away to take your number and connect you with the nearest office, with no need to navigate through a frustrating automated system. One of the best things about remodeling with Crawl Space Solutions of Arkansas is that we do it all. From the walls to the floors, ceilings, lighting, bathroom, closets, wall partitions, windows, and all the finishing touches, you can count on our skilled and experienced contractors to take care of your basement needs. The basement can be remodeled in ten days or less, and it will be ready to use as soon as the installers leave your home, with no wait for grout to set or paint to dry! You will be pleasantly surprised by our basement finishing installers' skill, speed, and flexibility. They work in basements every day, and they are deeply aware of the unique challenges basement finishing presents, including low ceilings, beams, small windows, basement insulation, and all the other challenges that make a basement remodeling project in Arkansas like none other. 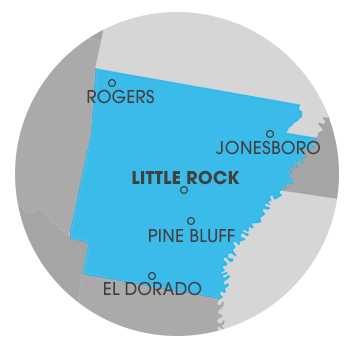 Crawl Space Solutions of Arkansas of Arkansas, including the North Little Rock area does not end their service when the installation is complete. Crawl Space Solutions of Arkansas would like to help you transform your basement into a warm, comfortable, and naturally private space. To get started with your free, no-obligation basement finishing or remodeling estimate, call or contact us online today!